Carrington Products is a family owned company and we have been in the Specialty Tube Bending business since 1946. Custom Mandrel Bending and Section Rolling is the heart and soul of Carringtons. From large ongoing contracts to small one off jobs, we are renowned throughout industries for our quality and service. We offer high quality Mandrel Bending in all metals from 8mm right up to 203mm. We can also Section Roll multi radius shapes, coils, curves and spirals. 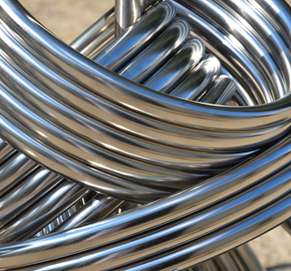 We stock a large range of stainless steel tube and can source all other materials for your job requirements. Other services offered are polishing pipe in house, drawing detail, cutting, scalloping, drilling, threading and expanding for multi process jobs. Whatever material you are planning on using from Mild Steel (raw/painted/galvanised), Aluminium, Brass, Copper, Duplex, Chrome Moly, CDS, 235MA, through to Mirror Finish Stainless Steel, we can bend and roll it all. Carringtons bend and roll Round, Square, RHS, Solid Bar and Flat Bar with an extensive range of tooling with various radii available in all sizes. We also roll angle. We even have the services of our own in house Toolmaker if new tooling is needed. From heat exchangers to UTE headboards & load racks, bike racks to bullbars, handrails and pool rails, hydraulic components and plumbingfittings, spirals and large radius bends. The industries we service include construction, auto, military, marine, food, wine, medical, plumbing, interior design, petrochemical, balustrading and manufacturing – usually for Fabricators, but also for DIY, 4×4, car, boat, motor bike and airplane enthusiasts and even for other bending companies. Most of our new customers come from referrals from existing customers, suppliers and other bending and rolling companies. We are happy to work from your hand sketches, computer drawing, templates and samples. Call our friendly team and I’m sure you will agree we have a great depth of knowledge and understanding along with the skills and equipment to enable us to best meet your needs. Contact Us Now for a quick response to your Bending and Rolling enquiries. We also provide machining services, scalloping, cutting, bending and polishing. Click here to view our collection of downloadable brochures.